You are at:Home»iPhone»Display»My iPhone Screen Flashes Red! Here’s The Real Fix. Your iPhone screen is turning red and you don’t know what to do. Generally, iPhone screen distortions happen when a display cable isn’t making a clean connection to your iPhone’s logic board. In this article, I’ll show you what to do when your iPhone screen flashes red and show you how to fix the problem for good. Is My iPhone Broken? Do I Need A New Screen? At this point, it’s too early to tell whether or not your iPhone is broken. Many times, an iPhone isn’t broken, but has been dropped or jostled in a way that has loosened a low-voltage differential signaling (LVDS) cable from the logic board. Even the tiniest imperfection with an LVDS cable can cause an iPhone screen to flash red. So while your iPhone may look fine, there could be an underlying issue with the hardware. First, we need to rule out any possibility of a software glitch. To do so, we’ll try turning your iPhone off an back on again. Press and hold the power button until the red power icon and slide to power off appears on the screen on your iPhone. Then, swipe the red power icon from left to right. Wait about 30 seconds before turning your iPhone back on, just to make sure it has the chance to fully shut down. 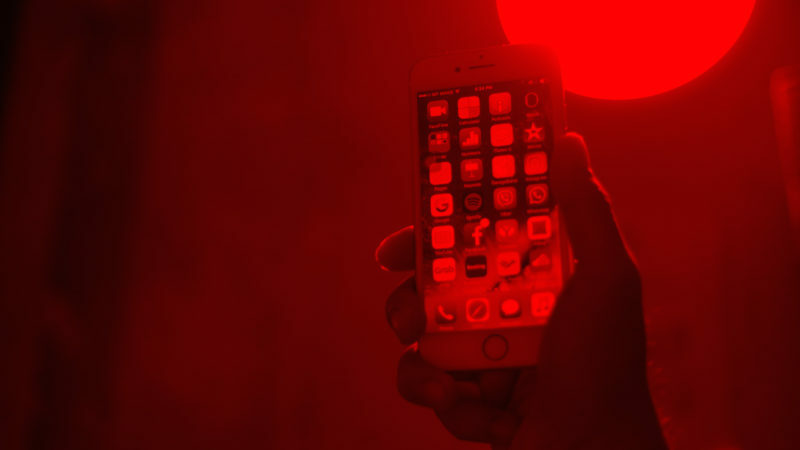 If you turned your iPhone back on and the screen still flashes red, your iPhone probably has a hardware problem. Before exploring your repair options, there are a couple of tricks you can try which may fix the problem. 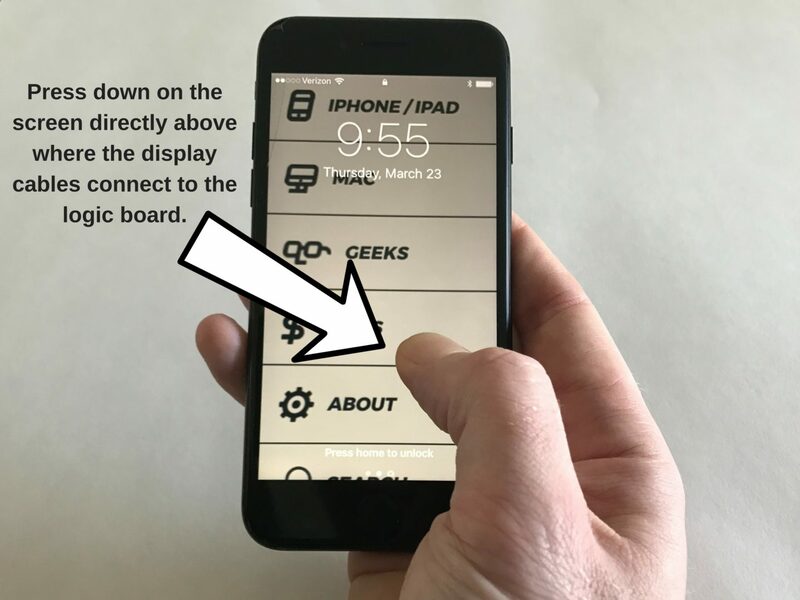 Our first hardware troubleshooting trick for when an iPhone screen flashes red is to press down on your iPhone’s screen where the display cables connect to the logic board. If the display cables are only slightly dislodged, there’s a chance that pressing down on the screen of your iPhone will put them back into place. Use your thumb to press down directly on the screen where the logic board connects to the display cables. If you’re unsure where to press, use the image above as a guide. A quick word of warning: be careful not to press down too hard on the screen of your iPhone because it could cause the screen to crack. Our second hardware troubleshooting trick is to hit the back of your iPhone. It may sound silly, but if a display cable is slightly out of place, hitting the back of your iPhone can get the cables back where they need to be. 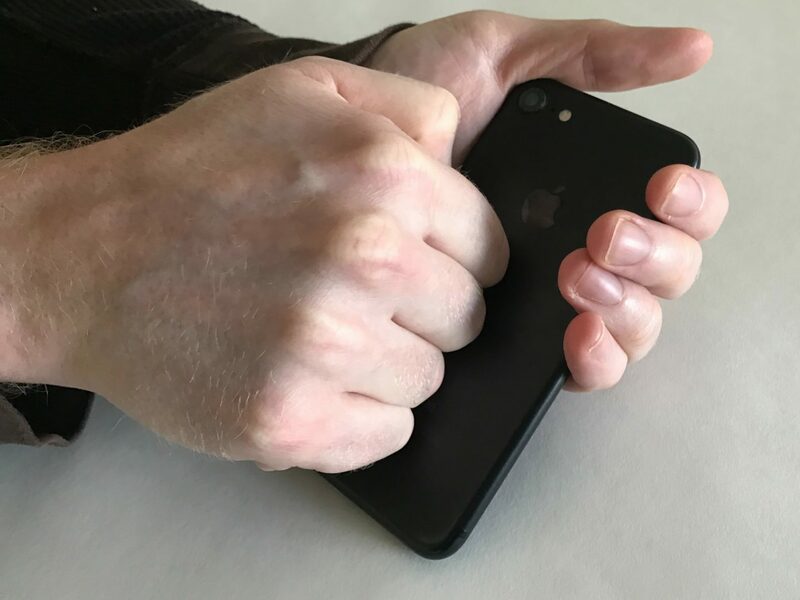 Make a small fist and hit the back of your iPhone. Make sure you don’t hit your iPhone too hard, as you could damage its internal components. Both of these tricks are fairly non-invasive, so we recommend that you give them both a try before exploring your repair options. If you’ve made it this far and your iPhone screen is still flashing red, you probably need to get your iPhone repaired. Fortunately, if your iPhone screen flashes red, or if the screen looks fuzzy, it can be repaired. You can visit or your local Apple Store or use Apple’s mail-in service by visiting Apple’s support website. If you do choose to go to the Genius Bar at your local Apple Store, we recommend that you set up an appointment first just to make sure they’ll have time to get to you. Puls is a third-party repair service that will come to you and fix your iPhone. Available in most major cities, Puls can send a certified technician to repair your iPhone in around an hour. Best of all, Puls repairs come with a lifetime warranty and are sometimes cheaper than what you’d be charged at the Apple Store. If you want to take a more hands-on approach, you can reconnect display cables to the logic board of your iPhone on your own if you have the right tools. You’ll need an iPhone repair kit with a pentalobe screwdriver, which you can purchase on Amazon for around $10. We recommend that you follow iFixIt’s guides which will walk you through how to remove the screen of your iPhone and reconnect the display cables to the logic board. You’ve successfully fixed your iPhone screen, or you know what steps you need to take in order to get it repaired. 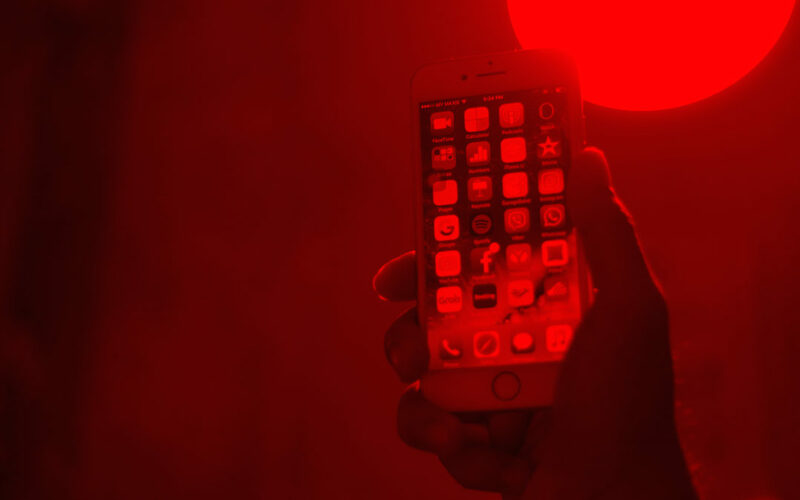 Now that you know what to do when an iPhone screen flashes red, we hope you’ll share this article on social media with your friends and family. If you have any other questions about your iPhone, feel free to leave a comment down below! Previous ArticleHow To Hard Reset An iPhone & Why It’s Bad: An Apple Tech Explains! Next Article My iPhone Says “Scam Likely”: Here’s Why It Happens!